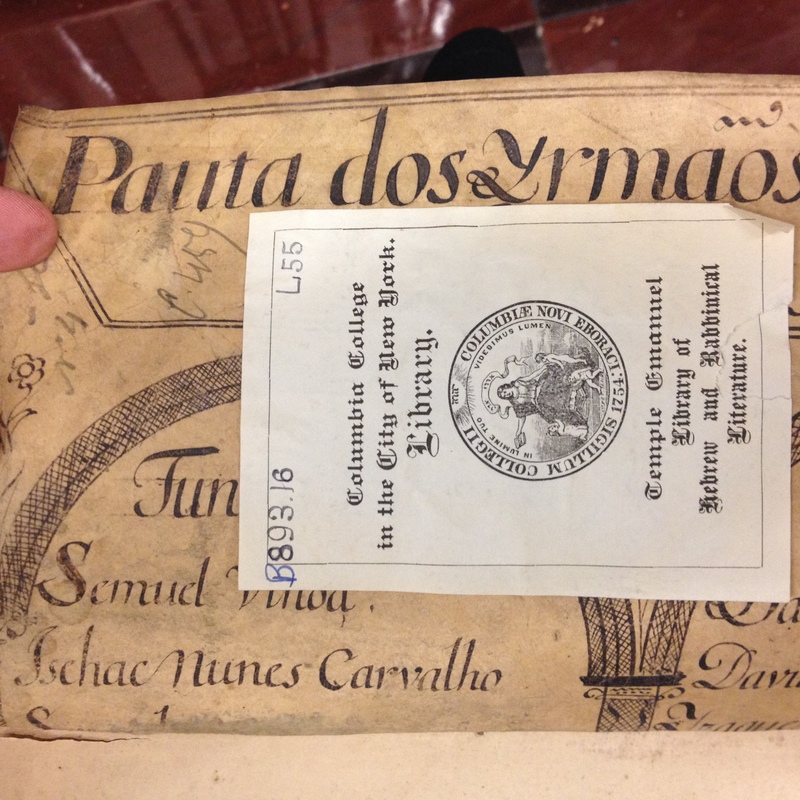 The Conservation Department at Columbia University Libraries is an often unsung hero of the libraries. The work of their talented conservators encompasses all areas of the library, and ensures that our collections, both modern and ancient, will endure for years to come. Many times, in a routin e conservation activity, hidden aspects of books come to the fore. 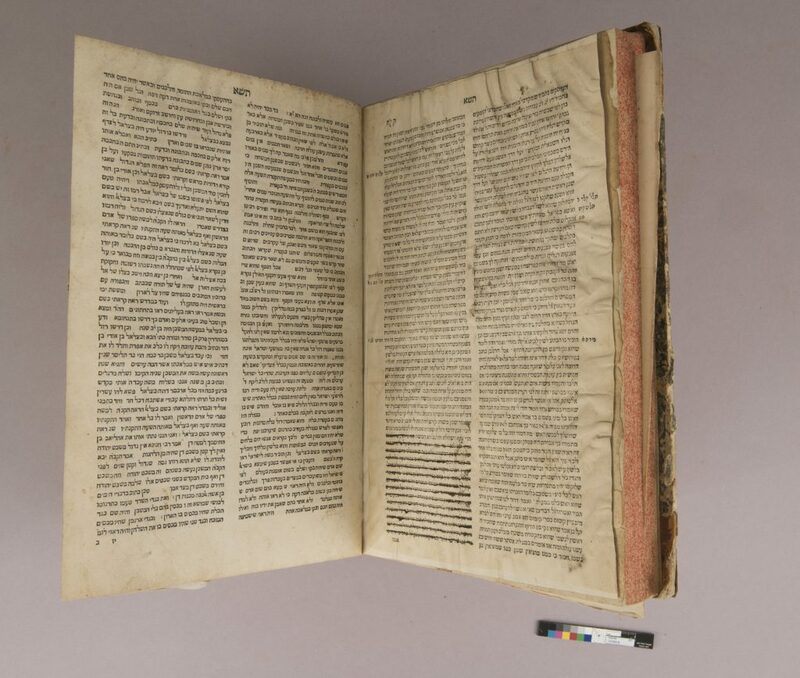 This was the case of a commentary on the Bible by Rabbenu Bahye, printed in 1514 in Pesaro by Gershom Soncino. 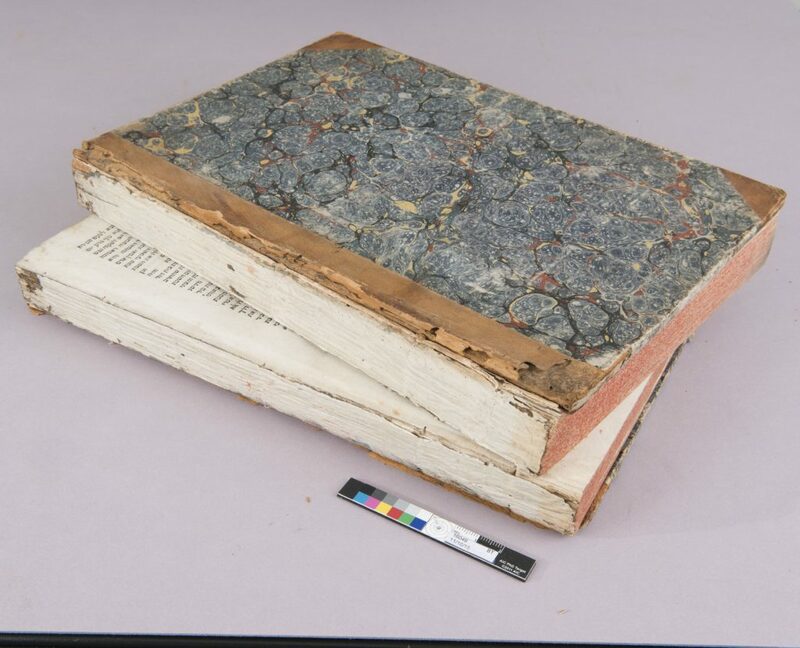 The Conservation Department had received the book because the text block was broken, and they planned to repair the book and box it for protection. 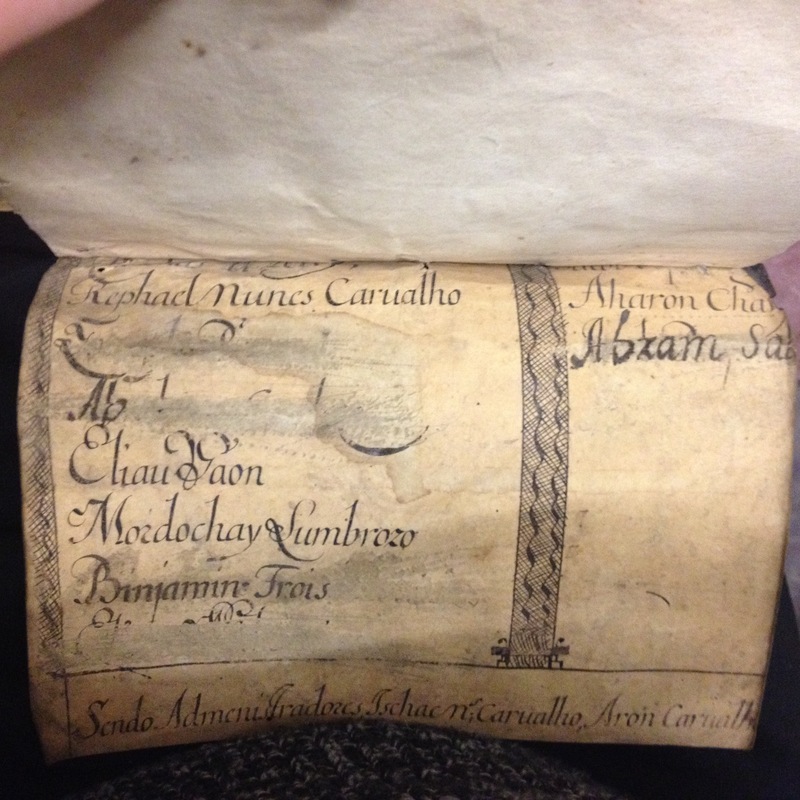 While assessing the book, however, the conservators noticed an additional oddity. As shown below, two pages from another edition of the same book had been pasted together inside the book to replace a missing page. 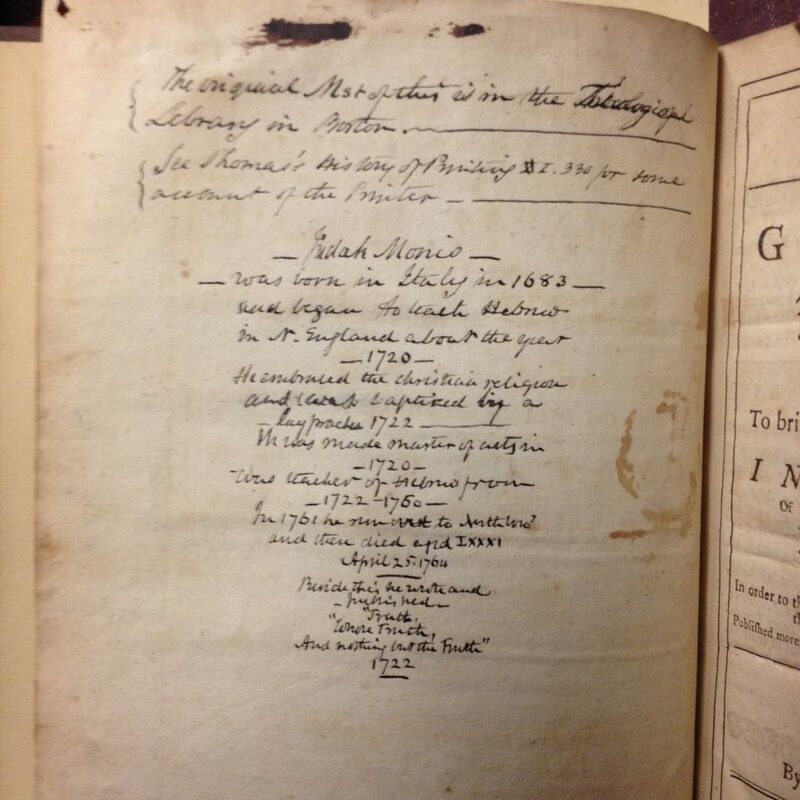 The owner then crossed out the first few lines of the replacement page, so that text would be continuous from the original edition. The owner did the same for the end of the added pages, again ensuring continuity for the reader of the text. As you can see here, the text block was separated right at this point in the book. The added pages had weakened the book, and so the pages needed to be separated in order for the book to be stabilized. Once the pages were separated, the question then was: how to maintain the integrity of the history of this book, without compromising its stability? The decision was made to line the versos of the replacement pages (which had previously been glued to each other and were thus hidden) with a translucent material, so the text would show, but only lightly, indicating that this had not been the original way that the book was used. A note describing the treatment was also included with the book, so a reader could understand how the pages had initially been glued together. The amount of thought and effort that goes into conservation work is incredible. The conservators think about all aspects of the book, physical, intellectual, and historical, before making a decision about treatment. Many thanks to Emily Cohen and Alexis Hagadorn for their fantastic work on this book! 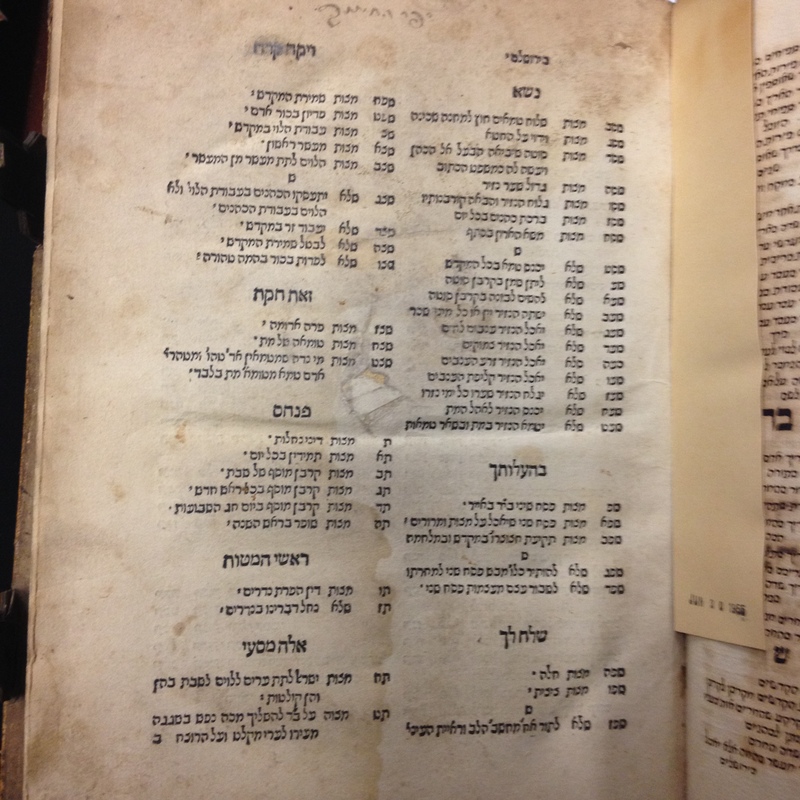 This entry was posted in Uncategorized and tagged conservation, Hebrew_printing, Rare_Books, RBML on July 1, 2016 by Michelle. "Parchment leaf before t.-p. of v. 2 contains a poem in ms. by Moses Benjamin Foa." Well, who was Moses Benjamin Foa? 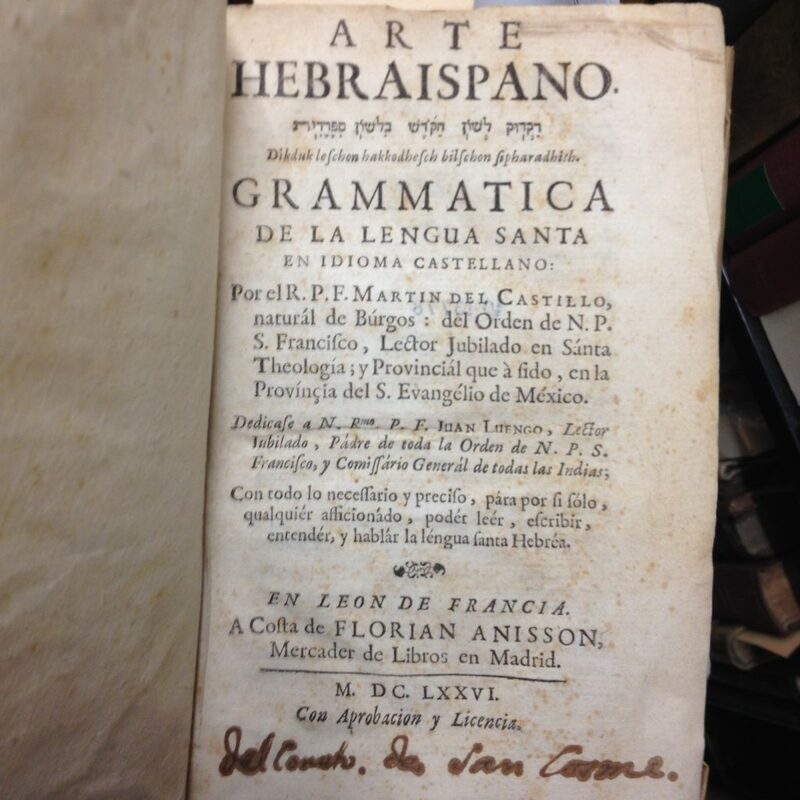 It turns out that he was an important 18th century bookdealer and collector in Reggio Emilia (Italy), who not only sold books to the ducal library of Mantua, but also bought and donated to his home community of Reggio Emilia the library of Israel Benjamin Bassano, another noted book collector and scholar. Considering Columbia's recent purchase of an entire archive of early 20th century Hebrew book dealers' letters and documents, it is nice to know that Columbia's book dealer collection goes back at least two hundred years earlier. Any further insight into Moses Benjamin Foa or Israel Benjamin Bassano (perhaps Bassani?) would be greatly appreciated. Update: More information about Moses Benjamin Foa (in Italian) can be found here. Many thanks to Francesco Spagnolo of the Magnes. This entry was posted in Uncategorized and tagged Bibliography, Hebrew_printing, Italy, Rare_Books, RBML on January 2, 2013 by Michelle. One of the first things to do before embarking on any research is to check the current work on the topic being studied. In many cases, this can be very daunting: How do I find what has already been done? Sure, I can check CLIO to see if there are books published in my area of interest, but it can be hard to tell from the title or subjects listed in a CLIO record whether a book is relevant to my research. This can become especially hard with journals or edited volumes, which don’t include the titles of every chapter or article in the CLIO record. Let’s say I am interested in finding out more information about a book printed in Mantua in 1474, called Nofet Tsufim. A search of CLIO for "Nofet Tsufim" as a keyword leads to seven books, two of which are relevant. It turns out that the two records are really for the same book, one of which is at Burke, and one at Butler. Okay, this is definitely a start. The book is a reprint of the original, with some comments in the introduction that are helpful for understanding the background of the book’s printing. But where do I go now for more information? The answer is RAMBI. RAMBI has indexed (i.e. created a catalog record) for nearly every article or chapter dealing with Jewish Studies. When I put the same keywords in my search in RAMBI ("Nofet Tsufim"), I got 5 results, all of which were relevant to my research, and all from books/journals that I never would have picked up otherwise in my searching (Frank Talmage Memorial Volume, Prooftexts, Rhetorica, etc.). The results list the year and page numbers where my articles are found, and so all I have to do is check CLIO to see if we have it, and if we don’t, I can request a PDF copy of the chapter or article via Interlibrary Loan. This entry was posted in Uncategorized and tagged digital, Hebrew_printing, Journal Articles, Research tips, Secondary Sources on September 19, 2011 by Michelle. The word manuscript comes from a combination of two Latin words (manu, meaning "hand"; and script, meaning "writing"). In the literal definition of the word, a manuscript is anything written by hand (as opposed to printed). 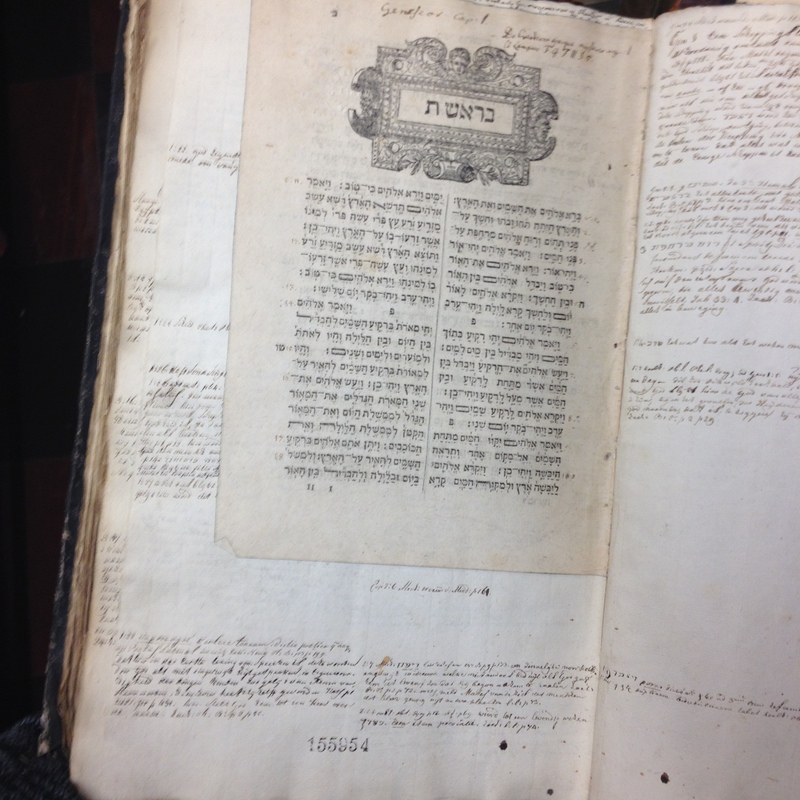 The manuscript you see in this post would not be found as part of our "Hebrew manuscript collection," but is a manuscript nonetheless. 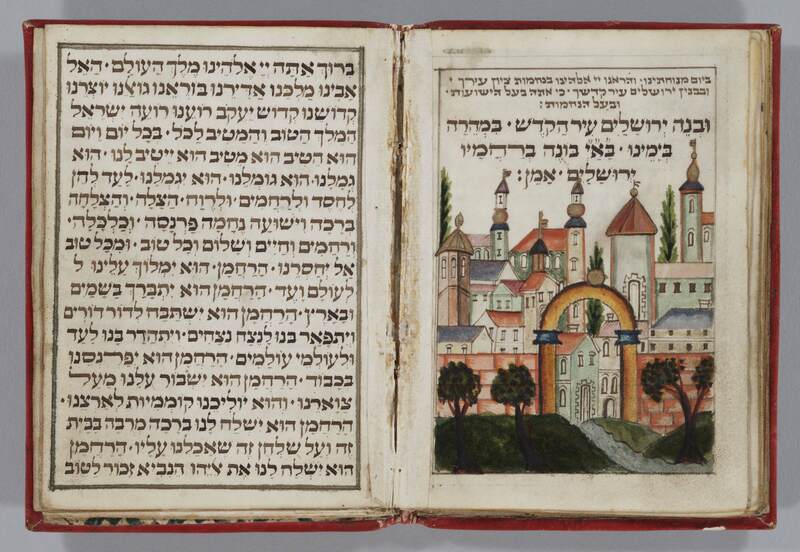 This manuscript is one of four leaves bound with a printed book in RBML, the Nofet Zufim, by Judah Messer Leon, printed in Mantua between 1474 and 1476 (Call Number: Goff Heb-62). 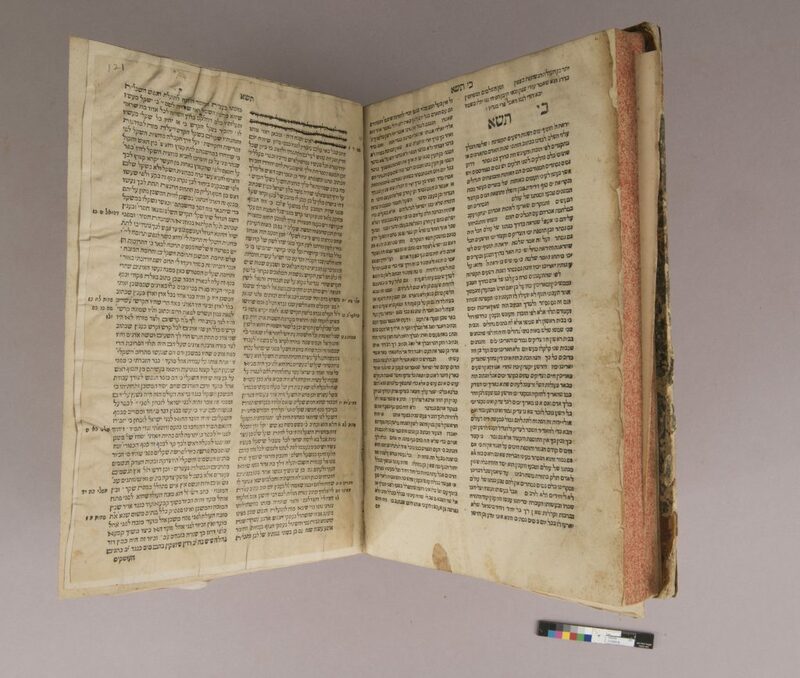 Nofet Zufim is a unique work in its own right as a Hebrew incunable (one of the first books printed from the invention of the printing press through 1501), and is the first book printed in Hebrew during the lifetime of its author. It was extremely controversial, a philosophical text which used texts from the Hebrew Bible to demonstrate Aristotelian rhetoric. (Its author was later expelled from Mantua, after an argument with the famous 15th century rabbi, Joseph Colon, also known as the MaHaRIK). 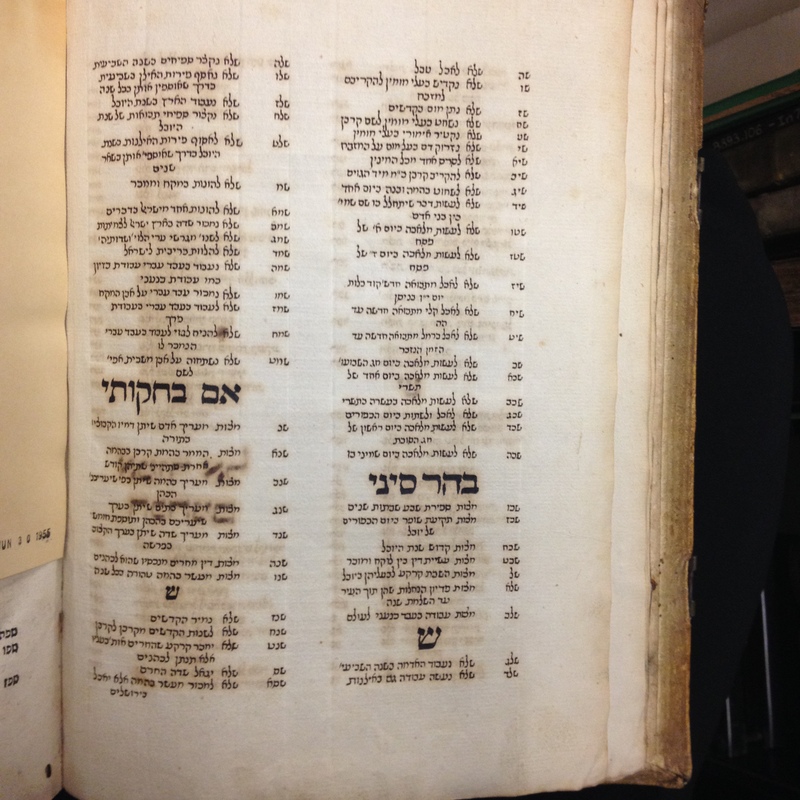 Columbia has 29 Hebrew incunabula in RBML. But this series is supposed to discuss manuscripts, not printed works, and so I digress. 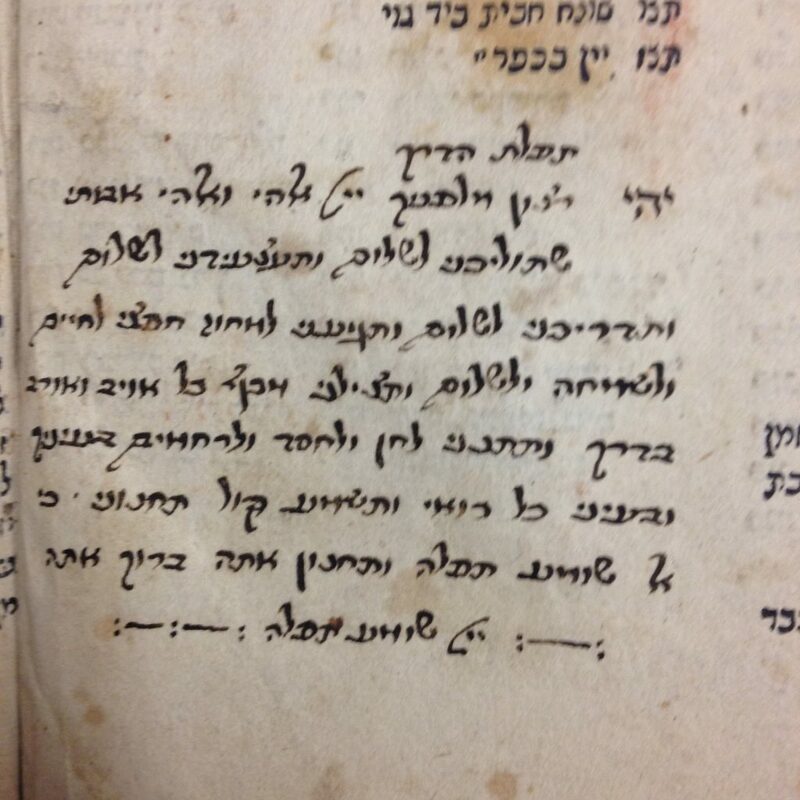 What’s fascinating about the manuscript attached here is that it’s a discussion of the history of early Hebrew printing. 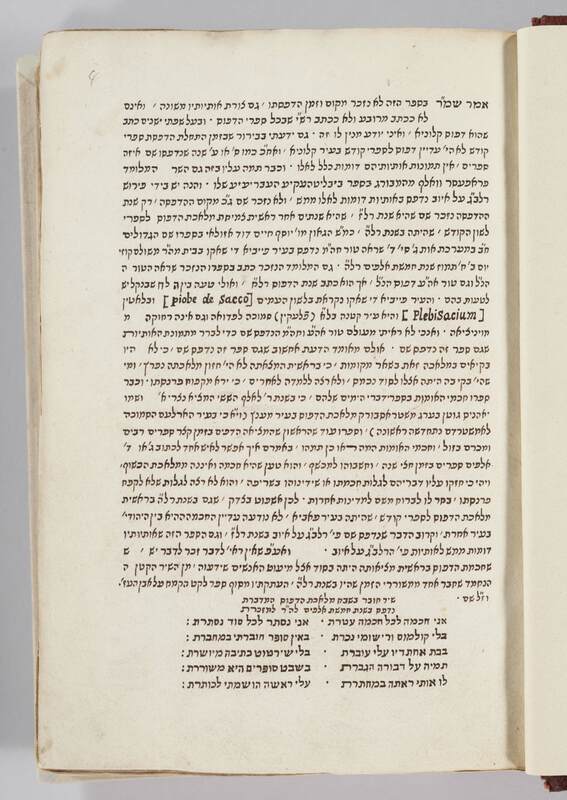 You may notice the word in brackets, in Latin script, "Piobe de Sacco" – one of the two places that claim the very first dated Hebrew book, in this case an Arba Turim by Jacob ben Asher, which was completed on July 3, 1475 (the poem listed at the bottom of the manuscript comes from the colophon of the Arba Turim of Piove di Sacco). 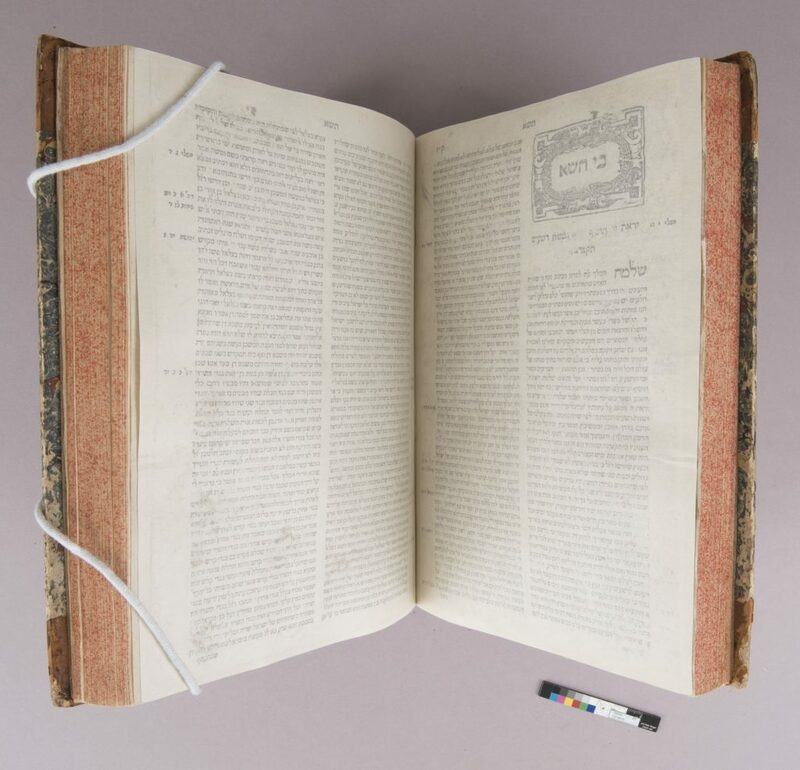 This page has been dated to the 19th century, which gives us a glimpse into the research that was known at the time about early Hebrew printing. Another page bound in with this book has been dated to the 18th century. 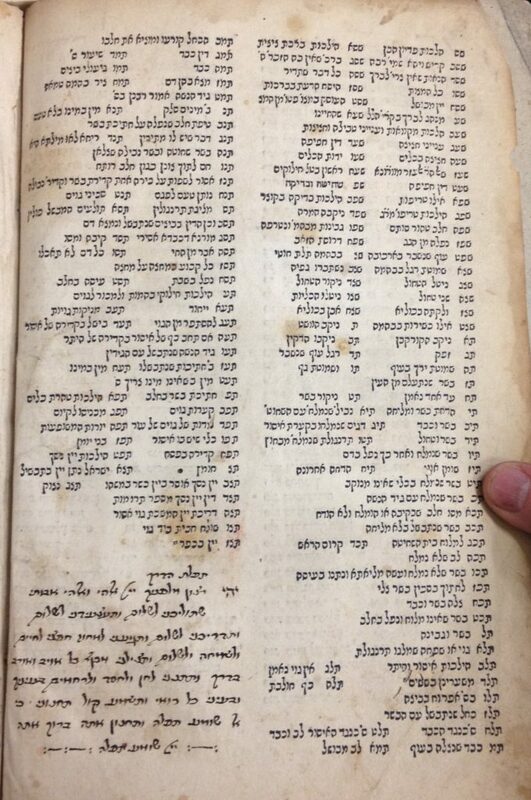 It also tells us a little bit about one of the owners of this book – at one point, this copy of the Nofet Zufim was owned by someone who was interested in it, not as a book of rhetoric, but rather as a rare specimen of the early days of Hebrew printing. 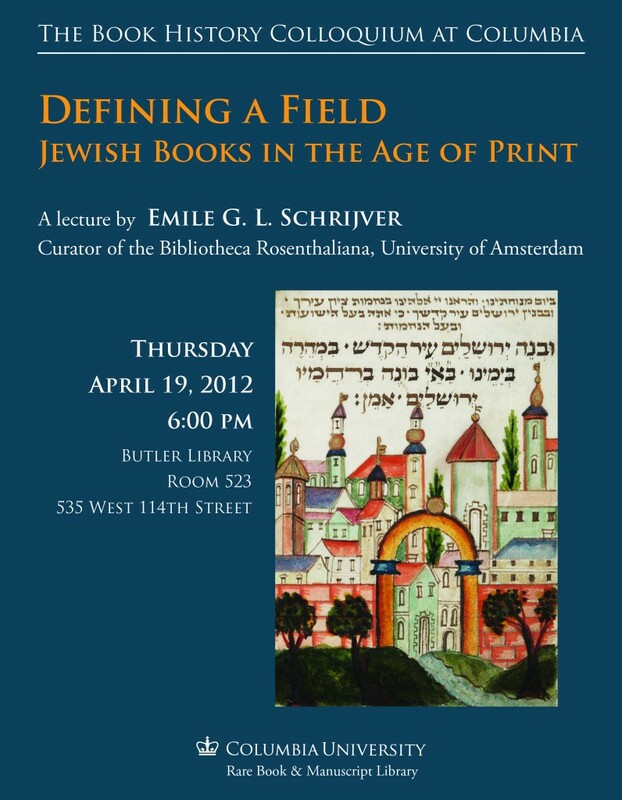 This entry was posted in Primary Sources and tagged Bitton_Yoram, Hebrew_mss@cul, Hebrew_printing, Incunabula, Primary Sources, Rare_Books, RBML on April 11, 2011 by Michelle. 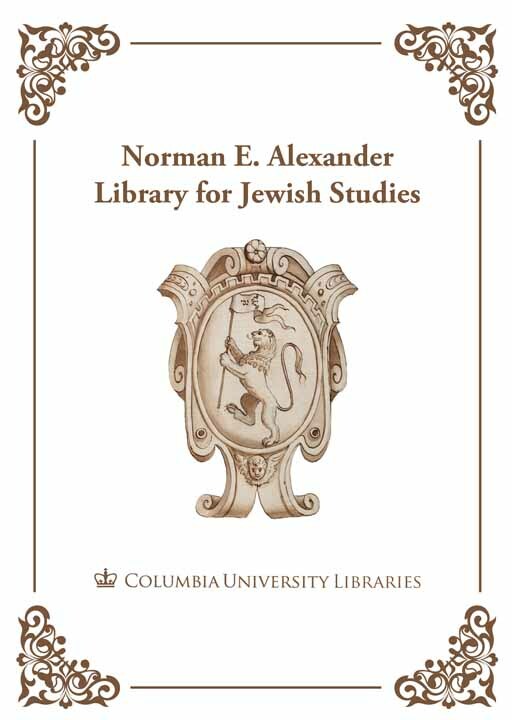 I am very pleased to announce the addition of a new database to Columbia's Jewish Studies collection, the Bibliography of the Hebrew Book. This exceptional resource is a detailed database of approximately 90% of the books printed in Hebrew letters between 1470 and 1960 (Ladino and Judeo-Arabic books are all included; Yiddish books are not – although the database does include books printed in both Hebrew and Yiddish) The database includes more than 141,000 titles, often with extensive bibliographic information (textual variants, unique pagination, etc.) about the individual books included in the records. Much of the database, including the records themselves, are in Hebrew. For help with the site, feel free to contact the Jewish Studies Librarian (jewishstudies@libraries.cul.columbia.edu). Update: The Bibliography of the Hebrew Book is now freely available online through the National Library of Israel. 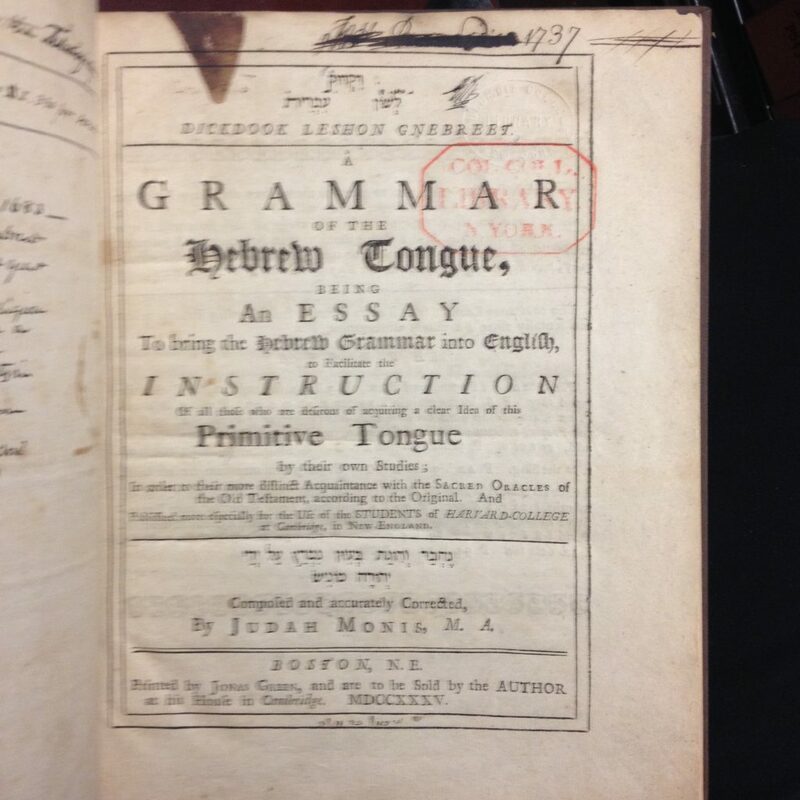 This entry was posted in Secondary Sources and tagged Bibliography, Hebrew_printing, Rare_Books, Secondary Sources on February 7, 2011 by Michelle.